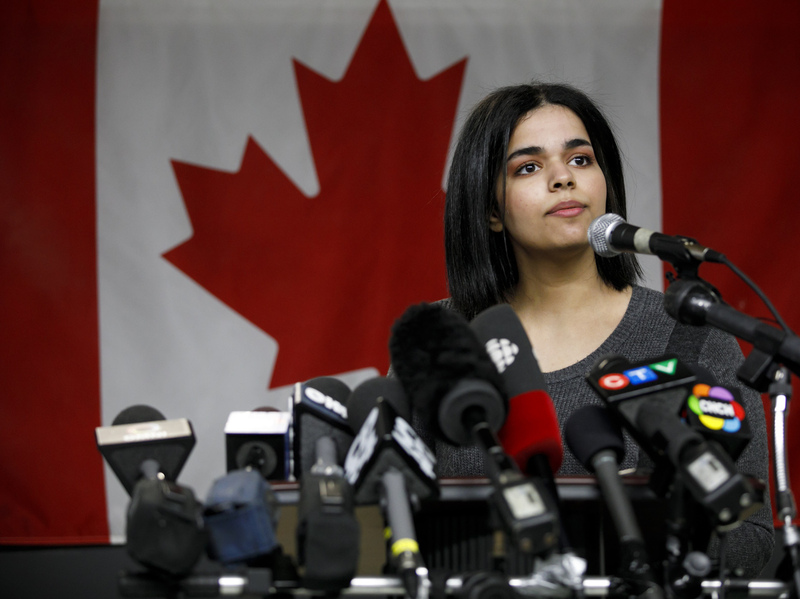 Rahaf Mohammed Alqunun, 18, addresses the media during a news conference at a refugee resettling agency in Toronto on Jan. 15. She pledged to "work in support of freedom for women around the world, the same freedom I experienced on the first day I arrived in Canada." Alqunun was offered asylum in Canada in January after she barricaded herself in a Bangkok hotel room, from where she mounted a sophisticated social media campaign that sparked international headlines and sympathy. But in Saudi Arabia, Alqunun's successful escape from a prominent family spurred harsh media attacks and a social media narrative accusing Western nations of using Saudi women to undermine the kingdom. Still, the domestic campaign is unlikely to deter other young women from fleeing the kingdom, say activists who are in touch with women planning to run. The high-profile story is "going to set off copycat scenarios," says Bessma Momani, a Middle East specialist at Canada's University of Waterloo. "I think women will feel more emboldened." She explains that Alqunun's story has provided a virtual road map for others and revealed a network of groups willing to work out logistics and offer escape strategies. "Rahaf's story showed there is a quasi-organized group that is willing to help," Momani says. Alqunun's asylum in Canada comes as Saudi Arabia's Crown Prince Mohammed bin Salman, often referred to as MBS, portrays himself as the leader who is steering the country toward a more secular modernity. Movie theaters have reopened. Saudi women can now drive cars and attend sports events. The kingdom says it has made it easier for women to enter the workplace. "Any way you slice it, MBS has done more change than anyone in the last 50 years," says Ali Shihabi, who heads the Arabia Foundation, a pro-Saudi think tank in Washington, D.C. Reform is "an art rather than a science," he says, "and being an art, there are going to be mistakes. He can't let the snowball get too big." The crown prince is also behind a harsh crackdown on political dissent. That includes jailing more than a dozen women's rights activists who were vocally pushing for an end to Saudi Arabia's guardianship system, which allows male relatives to control most aspects of a woman's life. "When MBS came, he made it clear: 'You either listen to me, or you go to jail,' " says Yasmine Farouk, a visiting scholar in the Middle East Program at the Carnegie Endowment for International Peace in Washington. "He is that much of a dictator that he is able to impose measures that other kings were too scared to impose on society. We are talking about a regime that wants to do everything under its control." But the growing number of Saudis seeking refuge abroad undermines Prince Mohammed's international image as a leader bringing new personal freedoms to the kingdom, says 30-year-old Samah Damanhoori. She was granted asylum in the United States last year after she accused her family of abuse and declared she was no longer a Muslim. "OK, we are going to let you drive — happy now? Stop running away," she says, to explain her views on reforms introduced by Prince Mohammed. "But more women are running away. We have to do that to get them full rights." In Saudi Arabia, men wield vast powers over women. The guardianship system gives male relatives control over women's travel, education, medical treatment and marriage. An app called Absher allows Saudi men to specify when and where a woman can travel. The service includes a message alert when a woman uses her passport at an airport or a border crossing. Fleeing even an abusive home is a crime. If caught, a woman can be jailed or housed in a government-run shelter until her guardian permits her release. Alqunun's success was a "huge shake," Damanhoori says, because she comes from a prominent family, the daughter of a powerful governor. "The more powerful the family, the harder for a woman to escape, because of family connections. But she made it." Alqunun's family status may explain why the Saudi government has ramped up a campaign to stem the flow. In recent weeks, the General Department for Counter Extremism released an online video as a warning. The animated message compares women who flee the country to young men who join terrorist groups — and blames a vast international conspiracy that it says is aiming to damage the kingdom's image through its youth. "Everyone who tried to escape, they compare her with ISIS — it's horrible," complains Damanhoori. "This is not going to end," says Hala Aldosari, a Saudi activist and writer based in New York. "It will get worse." Aldosari says the government blames "agents of the West" and "women activists" as the culprits of the alleged global plot to destabilize Saudi Arabia, "rather than the grievance of the women." She says the common denominator among those trying to flee is that they are "women who come from controlling or abusive families" and who believe that running is the only way to survive. The rise of social media has opened a window for people to compare Saudi women's rights with women's rights in other Gulf nations. "Saudi women are now more aware of the restriction they live with, and they take higher risks to escape," Aldosari says. Reliable statistics in Saudi Arabia on these escapes are hard to find. Some families don't report a missing daughter for fear of social stigma in a society where a family's honor is tied to the behavior of women. Figures on Saudi asylum-seekers abroad, however, are known to have increased. Saudis made at least 815 asylum claims worldwide in 2017 — including men and women — compared with 195 in 2012, according to the latest tallies published in the United Nations Refugee Agency's database. Leading destinations include the U.S., Canada, Germany, Sweden, the U.K. and Australia. Saudi women are now more aware of the restriction they live with, and they take higher risks to escape. In 2011, Manal al-Sharif was jailed for nine days in Saudi Arabia for protesting driving restrictions. Her activism cost her the custody of her son, she says. Now she is living in self-imposed exile in Sydney. "These proclaimed reforms are just refurbishing a huge cage," al-Sharif says of the changes in Saudi Arabia. "We can't run a country when half of it is depending on the other half." But inside the kingdom, the crown prince is largely viewed as trying to change that equation, says Farouk at Carnegie. "It really is a paradox. It's the strong man who is able to impose reforms without being afraid of the consequences." But Saudi officials know the consequences of the continued flight of women. That undermines the international message that Saudi Arabia is modernizing and that Prince Mohammed has opened a new era of freedoms. Alqunun's father, who is a governor, released a statement in January saying that the family had disowned the runaway and calling her "the mentally unstable daughter who has displayed insulting and disgraceful behavior." That prompted the 18-year-old to drop her family name, she told reporters. Her father reportedly denied physically abusing her or trying to force her into marriage, according to The Associated Press. So far, Farouk says, the domestic response, even among women, is to condemn Alqunun's escape as reckless. "They don't care," Farouk says. "Things have changed in their daily life: They can drive to work, they can go to concerts, play sports. As long as their daily life has been made easier, why care about politics?" But there is still a limit to personal freedoms. "They will care when they try to contest a policy at work," she says. "They will be jailed or interrogated, or their fathers will have to get them out of the police station. They will care, but it will take time."